As we all know dal is a good source of protein especially for vegetarians,I make sure that I include one kind of dal/legumes in my daily meal in some form or the other.As it is quite boring to eat the same variety of dals on daily basis I usually stock up my pantry with all kinds of dals and lentils available in market so that I would not repeat the same dal at least for a few days.I combine a few kinds of dals for different tastes and this is one such dal which is simple yet delicious for a daily meal.This is very similar to my Chilka Urad dal recipe where I replaced chilka urad with chilka moong dal.Chilka basically means skin. 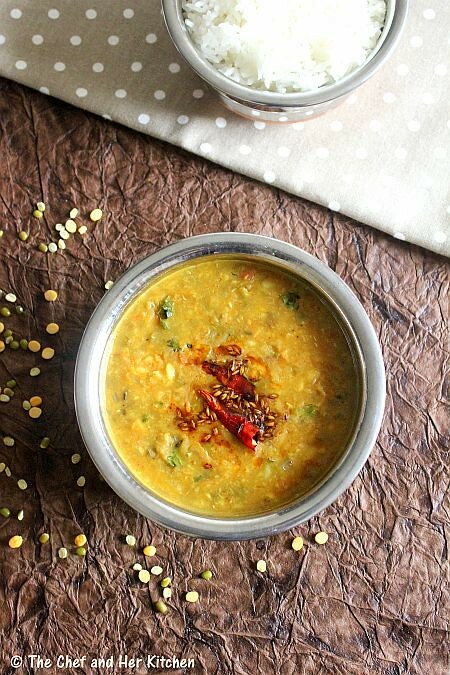 I used split whole green moong dal for this.I add chana dal to it as it enhances the texture of the dish. Wash and soak chana and moong dal mixed for 10 mins.Add a pinch of turmeric to it.pressure cook dal for 2 whistles and reduce the flame and let it cook for 5-7 mins. Add oil in a tadka pan and crackle cumin seeds, slit green chilli, coriander powder, cumin powder, garam masala powder and Asafoetida. Add the tadka to the dal and give a mix properly and cook for 4-5 mins. Add chopped coriander to it and give a stir. 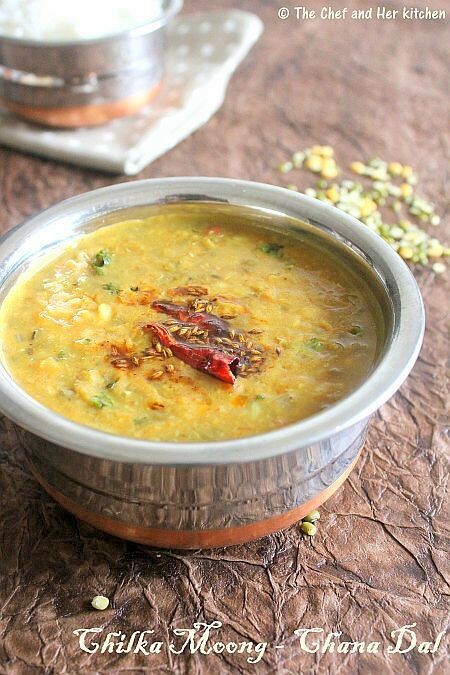 Meanwhile heat oil/ghee in the same tadka pan and crackle cumin seeds and add asafoetida,red chillies and red chili powder and pour it into the dal and cover it immediately.Just before serving mix it in the dal and serve. 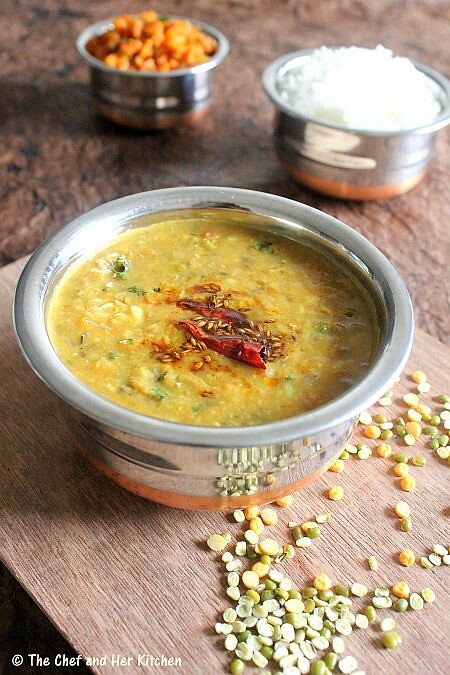 You can follow the same process for making any dal like yellow moong dal, whole moong, toor dal, masoor dal, whole masoor dal, chilka urad-chana dal, toor-chana dal, mixed dal, chana dal. You can also follow the same process for legumes like white/black chickpeas,rajma,lobia but make sure you soak them for 7-8 hrs. You can add a tsp of Kasuri methi while frying onion-tomato mixture for a different flavor. My mom made this..somehow I never get this here from where I buy the grocery so never made...looks so delicious..nice..
nice menu... 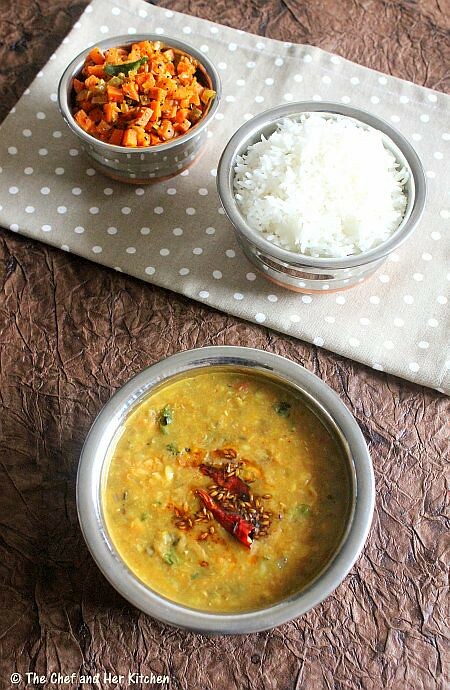 I love to prepare dal . its looking so healthy and tasty. Awesome.Delicious. Can drink this dal.